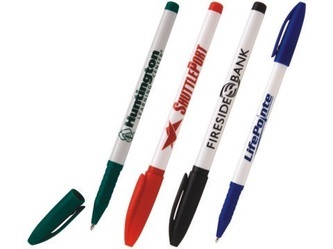 Last year, custom printed promotional pens were a top seller. This year, they are right back on top. Next year, there is a pretty darn good chance that plastic personalized pens and metal gift pens will again be atop the winners list. Why? That is a loaded question. 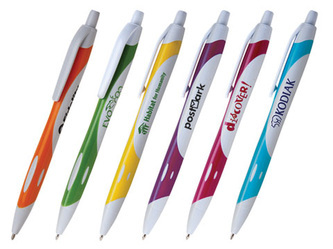 Custom logo pens are used by just about every industry. 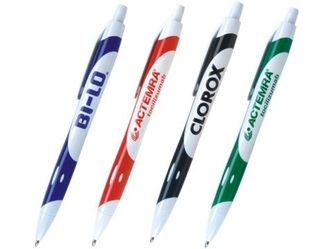 Everyone from accounting firms to doctors ordering these for nurse appreciation month create an ever increasing demand for customized writing instruments. 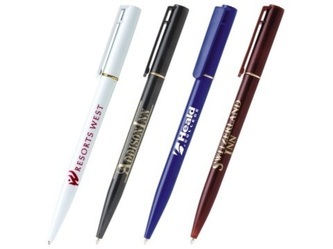 We sell promotional pens that you can't find anywhere else, but also choose to carry promotional products industry superstars such as Bic, Sanford, Parker, Waterman, Sheaffer, and more. We offer other pen lines as a convenience to our loyal customers, as our purchasing power allows for us to provide great pricing on personalized pens. 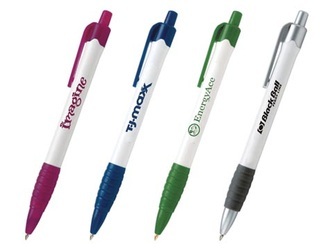 We carry these fantastic promotional items in every material, color, and shape imaginable. Looking for something that is comfortable with which to write for long periods of time? 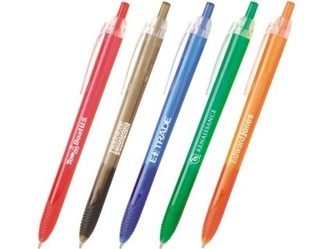 Try our promotional gel pens with a grip. Looking for bright, fun colors? We have neons and translucents that make great summer trade show giveaways. 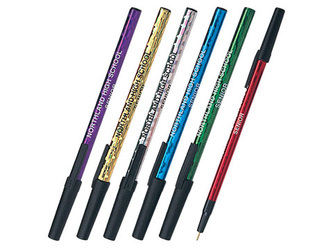 DID you happen to notice that the vast majority of our wholesale imprinted writing instruments include free shipping? This "what you see is what you pay" or WYSIWYP (pronounced "wizzywhip"), is yet another way that we stand out from the competition. Not only are you saving on shipping of some great wholesale plastic or metal writing instruments, but you never get any surprises with us. We take great pride in clearly stating our costs, and do everything that we can to provide full transparency in our marketing services. 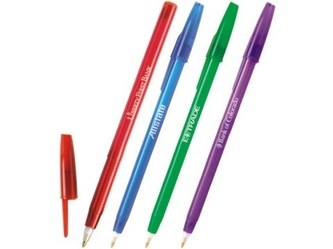 Sure, accountants, lawyers, and bookkeepers love our pens for our great pricing and superior service. We also, however, enjoy serving other hard working professions that need a quality and low cost personalized writing instrument on a daily basis. For example, the heads of athletic programs, even for high school- coaches, trainers, and the like- are constantly on the move. This means that they are always losing their pens, or wearing them out with the day to day beating that they take from the profession. It is with great care that we suggest certain items to athletic departments, because we know that these marketing pens are really going to be put through the ringer. Perhaps you are looking for a pen that can be used as part of a larger gift, such as padfolios We have a HUGE variety of available pen/pad combos that take your writing instrument from being an ordinary office necessity to a true imprinted corporate gift. 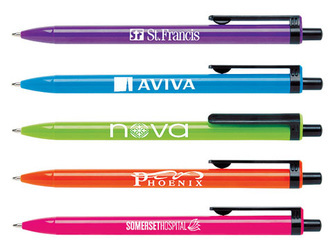 Here at Ad Specialty Products, we've seen companies use pens in just about every way imaginable. We can combine them with coffee mugs for a nice gift, or combine them with 2-3 other items and put them all in a customized tote bag for your client to really push their impression over the top. Hopefully you will notice, that aside from price and superior service, we place great focus on the variety of items that we provide within any specific category. This could not be more true with our wholesale pens category. We searched out the best deals on cap pens, click pens, and always have an eye on the best twist pens for your promotional budget. We also take care in providing the biggest selection of colors, because we serve such a wide variety of businesses and groups that have logo colors all throughout the spectrum. 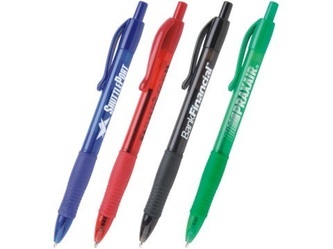 Looking for ballpoint, rollerball, or gel ink pens? we have all of those, and more! We are at the forefront of technology when it comes to offering the hottest new gel inks. In addition to marvelous advancements in ink technology, there have never been more ways to show off your logo in style. 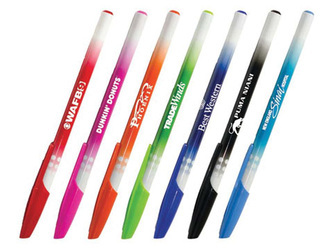 From scroll style full color imprints that unroll from the barrel of a pen to pens that project your logo onto the wall, things are getting truly wild in the world of writing. We even have a "billboard pen" that has a big square imprint area protruding from the top so that you get a full color 1"x1" imprint. While pioneered by Quill, photo dome technology has found its way into the lower priced market in the form of full color domed clip imprints. Very exciting stuff indeed! Today, thankfully, one cannot walk through a local store without encountering eco friendly items. We have our choice to use eco friendly grocery bags (which we sell), as well as the choice to eat fresh foods and those not produced by genetically modified means. Just a few short years ago, to "go green" and choose recycled items over those that are made by using harmful but cheap methods was considered more expensive. Recycled pens, bags, and such used to cost significantly more than their non eco friendly counterparts. These days, due to advancements in production capabilities, eco friendly items are roughly the same cost as their non eco friendly equivalent. You have the choice of hundreds of eco friendly pens, mugs, cups, coasters, and more. The most exciting items in the eco friendly pen category are the corn plastic pens, the water bottle pens, and the recycled paper pens. 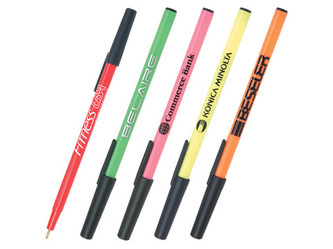 These are ultra low cost pens that are produced with recycled materials. We even have a bamboo pen that has a beautiful wood tone. Many companies only focus on certain segments within a particular category, for example, rather than carrying a full line of budget, mid range, and executive pens, they will just carry the category of cheap promotional pens. We feel the need to carry every price category, mainly because we serve such a broad client base. When the local hardware store calls and need a large quantity of wholesale promotional pens, we need to be ready with a fantastic selection of great writing, low cost cap-off and click writing instruments. When a state senator calls wanting an executive gift to remember, engraved with his friend's name or logo, we must be ready with the best from Waterman, Quill, and more. In the coming months, we will be placing a greater focus on the executive gifts segment, because we have a larger number of customizable writing instruments than ever before. Our fountain and rollerball pens in this category are absolute world class. 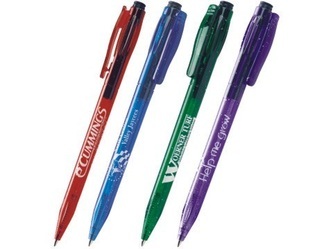 As mentioned above, Quill pens are some of our favorite writing instruments to sell, as they feature a full color logo on their patented slant top design as well as the option of laser engraving of names or logos. When we talk about logos, we are referring to a specific symbol used in conjunction with your company name to make a unique impression. We have access to the best graphic artist on the East Coast, and have a close working relationship with one of the best illustrators for when hand drawn work is needed. If you don't already have a logo, we are happy to assist, and have years of experience in this category. 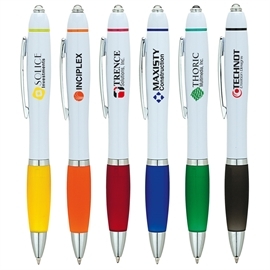 If all you need is your company name in a cool font, we can do that too, as we have hundreds of thousands of available fonts and typestyles that will look great engraved or printed on your wholesale promotional pens. Call 401-451-1874 to get started!